Summer time is Outreach season! One of the most important and interesting (and arguably the most fun) aspects of a job in conservation PR has to be doing outreach. It can also be one of the most hectic. 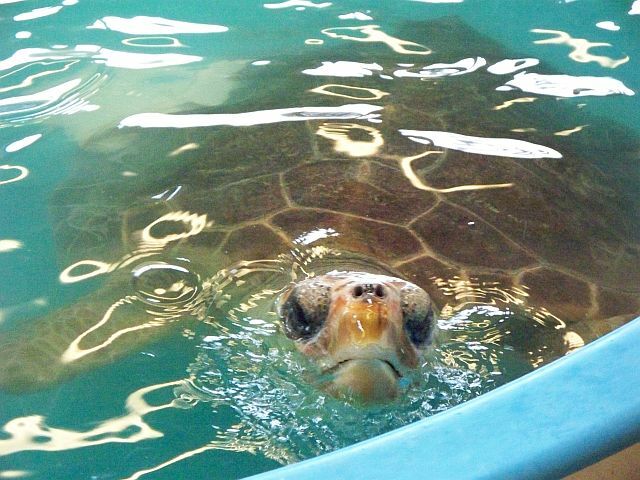 So we end up panicked, pulling out our hair with last-minute requests, pulling presentations out of the air and praying that nobody noticed that we just said loggerback sea turtle…(oops!) But hey – this is part of what make us good at what we do. We are willing to work on the fly, under stressful situations and often we pull it off with only us the wiser. This past season was especially crazy. Pretty much as soon as the insa nity of Weekend for Wildlife (deserving of a whole other post which it will get) was over, I began my season of outreach. 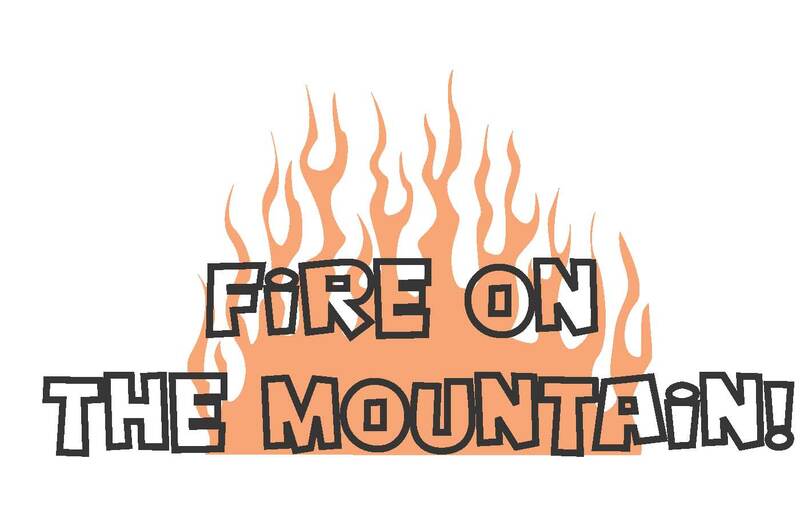 First on the docket, Fire on the Mountain. This was my third year running the show and I swear if ever Murphy’s law was true, it was this year. Everything that could go wrong simply did, right up to us canceling the event…after it had already started. we had vendors pull out and no-show, rain, a flooding river and recruiting volunteers was like pulling teeth. All that ans we went over budget for an event that essentially didn’t happen. ugh. Many thanks however to parks, TERN, BB&T, Jim Candler, the SCA crew and my brother for braving the elements and coming out anyway. Between getting ready for large events like these I was also doing smaller outreach events like doing presentations for schools. I visited an elementary school in Conyers where I taught a group of 2nd graders the importance of sea turtles (thanks Mark for the PowerPoint!). They were great and asked lots of questions. I felt like I really made a difference. Back to the insanity – The next big thing to come up was J.A.K.E.S. 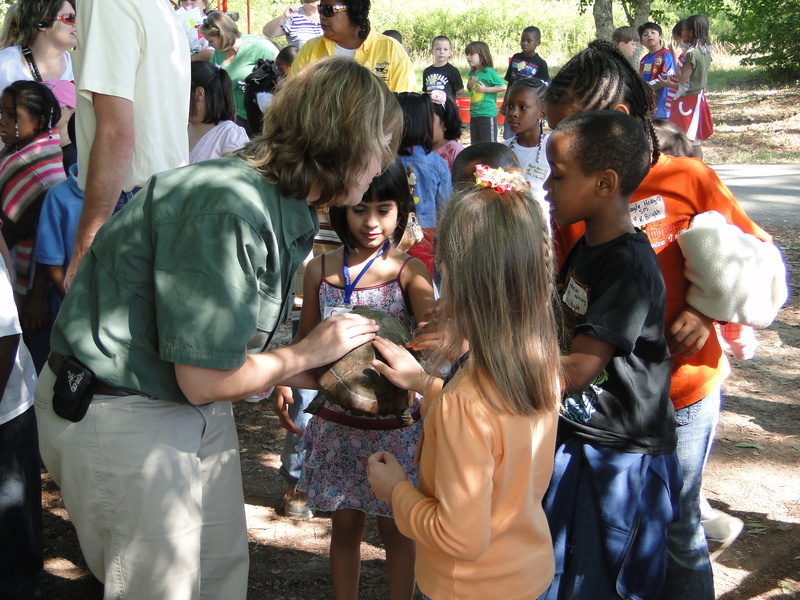 Day which is put on by the National Wild Turkey Federation every year and held at Charlie Elliott Wildlife Center in Mansfield, Georgia. I have had a booth there for the last three years. 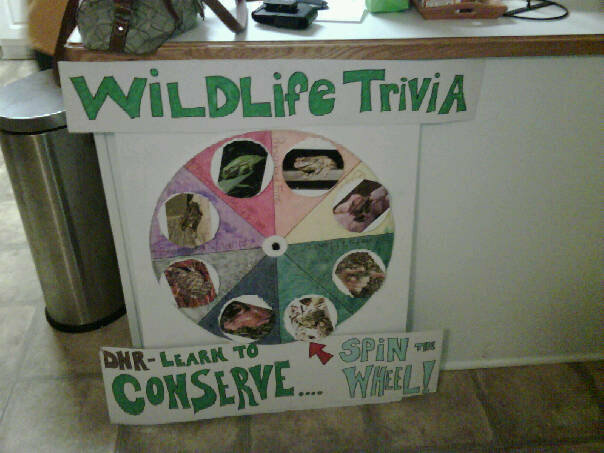 Usually I try to bring a live animal, (last year we had a tree frog) along with my trivia wheel but this year with things being rushed, I only had my trivia wheel. I still think it went okay and I had a good crowd and gave away most of my items. Dan (my director) even made a visit to my table with his daughter Lanier. I brought my favorite helper (my son, James) and together we played some good trivia with the visitors. Just when I thought things might be settling down I got a call from both a bank and an elementary school asking me to present for Earthday. I knew I couldn’t be in two places at once so I chose the school since I figures I’d make more of an impact there. I went out to Barksdale Elementary and rotated through five fourth grade classrooms. These kids loved the trivia and really got competitive. It was actually one of my better outreach events. Next up- World Ocean Day. I had been asked to help cover this last year along with fisheries and didn’t think much of it. Now I was being asked to do it all by myself. It wasn’t so bad, It was at the Georgia Aquarium after all, and I did get to watch the adorable beluga whales while I worked, but there were thousands of kids and several times I got mobbed, so it was difficult to tell if I really got through to any of them or if they just wanted my “stamp” in their passport so they could move on to the next booth. Sometimes those events are counterproductive. Probably one of the better events I had this past season was Outdoor Adventure day at Centennial Olympic Park in June. 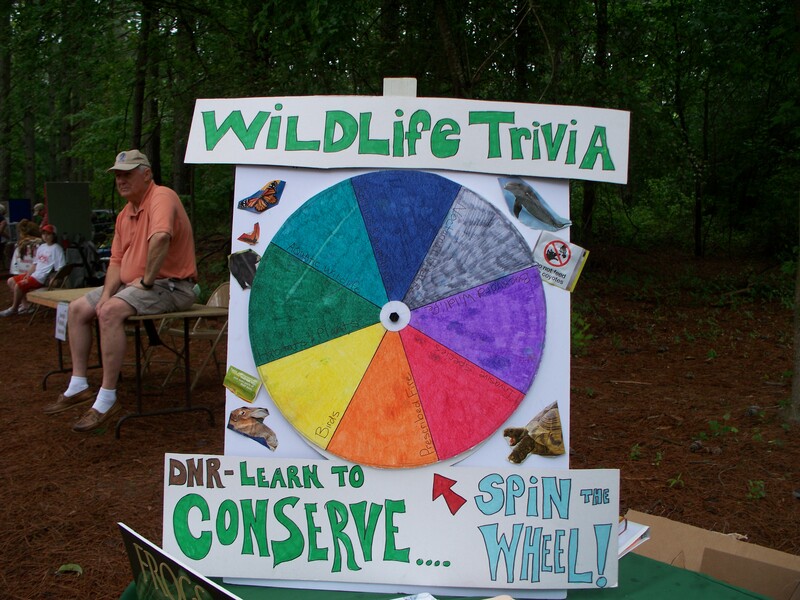 I worked this booth with Linda May and together we were able to reach a lot of people who may otherwise have never seen a gopher tortoise or a barred owl up close. Kids, fascinated, would follow the tortoise (nicknamed “Bondo” for her cracked shell) as she wandered around our area.Hopefully we convinced at least a few to buy our wildlife tag! ( I stayed close and kept watch.) Many of them had never seen a turtle, much less a large tortoise and certainly didn’t realize how quickly they could move. 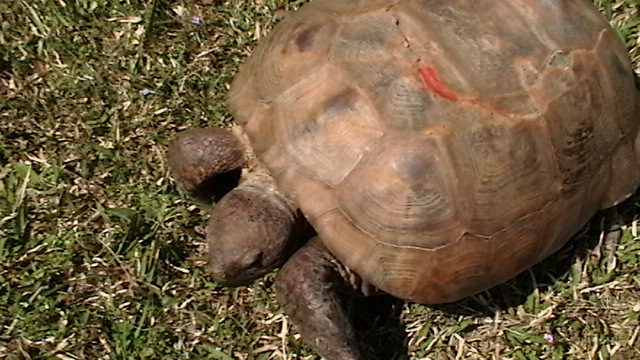 When I fed Bondo raspberries, it looked as if I had put lipstick on her and kids laughed. It was a great moment. So since June things have quieted down and the last little bit of outreach I have had to do is the Bat Blitz (see previous post). Of course the season is not over yet. There is still the State Wildlife Grant program 10th anniversary event, Coastfest, Colonial Coast Birding Festival and the Right Whale Festival to look forward to, but for now…I can breathe, even if only for a moment. I can’t say that I am not glad because truthfully, outreach season wears me out!! I love being able to reach people, especially kids, but there are times when you get all talked out. So for now, this adventurer is signing out!!! 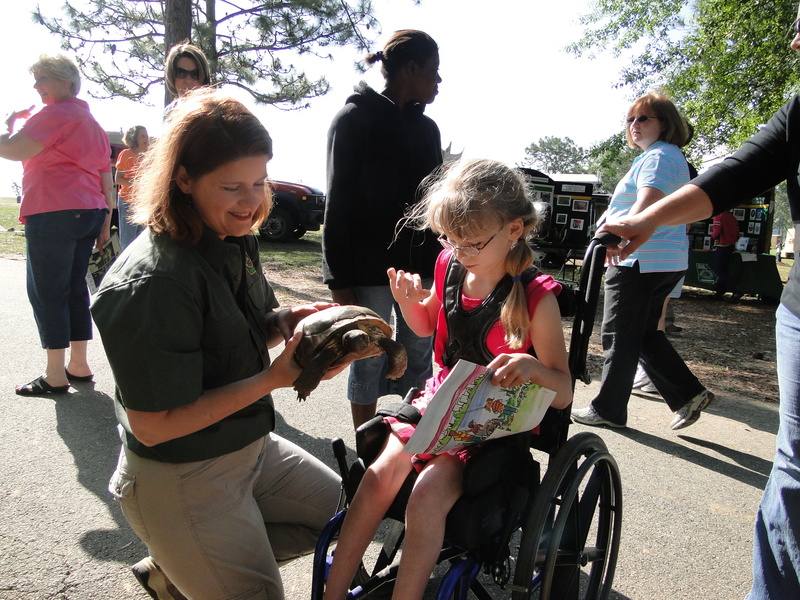 This entry was posted in Adventures and tagged Adventure, Atlanta, birding, children, Conservation, education, event, family, festival, Georgia, information, outdoors, Outreach, PR, schools, tortoise, Wildlife. Bookmark the permalink.